steel weighing surface; a built-in extensible blue backlight display control panel. It has a small size (diameter: 86mm) and but a quite sizable platform (diameter 72mm). The design has won a national patent. The scales in the series, like our other models, are characterized by professional high-quality, high-precision, high stability and big capacity. The series range 1000.05g to 30.002g. 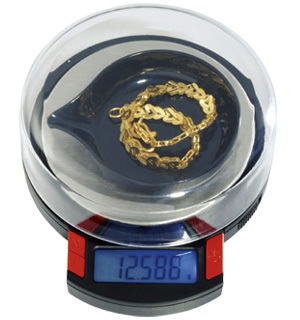 The six different measurement units （Gram�Carat�Pennyweight�Ounce�Troy ounce�Grain） can easily be converted. The Diamond Models in this series are equipped with a transparent protective cover, a big-volume loading tray, high-precision testing standard weights and a（PP material） outer box. The scales in these series are conveniently portable and are powered by only 2 "AAA" battery cells, achieving the purpose of weight reduction and environmental-friendliness. Professional products with life-long warranty is surely your choice. 1.Easy to operate(before each use no need for calibration). 3.Easy to change the units of weight (Gram�Carat�Pennyweight�Ounce�Troyounce�Grain). 10.Easy and chic plastic (PP)case suitable for carrying around. 11.Power requirements: 2דAAA�batteries are included.